Rohtas Fort is an example of early Muslim militairy architecture. It blends architectural and artistic traditions from Turkey and the Indian sub-continent to create the model for Mughal architecture. It was built in 1541 and survives intact til today. The Fort is a complex of defensive works, including walls, bastions, gates, a small mosque and a haveli (private mansion). A village has developed within the walled compound. 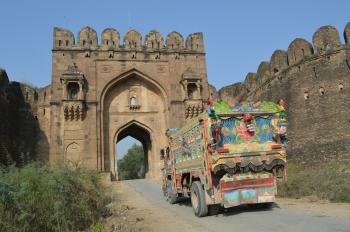 In December 2017, I set out on the Grand Trunk Road from Lahore to Islamabad, where, after around four hours, we reached the much-improved turn off to the sixteenth-century Rohtas Fort. From what I was told, the fort receives very few western tourists; in fact, I was the only overseas tourist during my visit, so I was assigned a personal security detail. I’m not sure a guard was necessary, though, since all of the locals who approached me were only after a group photo with the foreign intruder. Went to Rohtas last Saturday (Sept. 26, 2015), which was the second day of Eid-al-Azha. A very different experience from the last reviewer, who went on Ashura a couple years ago. As for the fort itsself, you can find a pictures all over the web, so I'll describe more of the personal experience here. First off, there were no police or any restrictions. Eid is a happy holiday whereas Ashura is not, and there were throngs of people in good moods. It seems all the young ladies were home cooking (it was the second day of the Thanksgiving-like Eid, after all), and the ratio of men:women was seriously skewed ~ probably 10:1. There were some families with children (including us), but primarily the other visitors on this day were young men in groups of two or three. As a female blonde Caucasian in Western clothes, there were a couple comments in Urdu (ignored) only one request for a selfie (declined) and so no problem in the harassment department given the attitudes of many non-metropolitan Pakistani young men. There were a couple of agressive young (female) beggars (also declined/ignored)that were more annoying. We happily overpaid (it was Eid, our kids run all over) a guide Rps. 500 ($5) to show us around and explain the Fort for a couple hours. Normally you should pay the guide ~Rps. 100/hr. ($1/hr. ), regardless of how many in your group. The freindly and helpful guide had passable English and passable knowledge of the fort. The biggest disappointment of the trip was the access road from G.T. to the fort. It's 8km long, and a total mess. A Jeep or other off-road vehicle would be ideal. It was deeply rutted, muddy in parts, narrow in parts. It was obviously a construction project started and abandoned mid-way. The piles of rocks/materials are beside the road in some places, in one lane is paved, and there's a two foot drop off to the other lane. Just really bad. The whole slow tortuous way we were bemoaning corrupt Pakistani politicians and how they get money and then only do half the job. But then we got there and saw the USAID sign. How embarassing. "This improved experience, brought to the Pakistani people by the American people..." or something equivalent. If we're going to abandon a project, at least take down the sign. It didn't come from the American people, it was the American government, and it nothing to be proud of. So, the phyiscal fort itsself? Impressive. Big. Old. Scary - there are few handrails, you can fall off the ramparts, into the dungeon, well, etc. It was designed as a fort, after all, not a child-friendly tourist experience. Anyone contemplating visiting Rohtas will likely know that Pakistan is not a place that puts a priority on safety. Be careful. Check your vertigo at the massive gate. If you stop to see the snake charmer, stand back, those are real king cobras in those baskets, and there's no medical facility that can treat snakebite within a half-hour/hour at least. But, yeah, it was great. We had a fun afternoon there. It was inexpensive (we paid the local price of 20 Rupees (20 cents) each. Parking was free. The kids could run around and climb the ramparts - Pakistan is very child-friendly in that way. The guide showed where canon were fired from, where the executions took place, how the defending soldiers would pour boiling water down chutes onto the attackers. The place is huge and if you have the stamina you can walk the 5km around the whole place. The small museum has interesting panels explaining the history in English and Urdu, which about no one was reading. The displays aren't exceptional. Some old money, old swords, knives, shields. A couple mannequins dressed as King and Queen. Definitely would reccommend you go. Definitely would reccommend that someone fix that road! Based on the number of reviews it has received (this is the 86th!! ), Rohtas would appear to be a remarkable place. However, almost all of them are from locals or the Pakistani diaspora, and phrases like “one of the most beautiful places I have ever seen” lead one to wonder about either the judgement or the objectivity of the reviewer! It would have been nice to have made a full visit to the fort to test such statements based on a wider knowledge of WHS around the World. Unfortunately, because of security concerns, the Pakistani Police only allowed us a truncated visit so our assessment must be somewhat limited! Rohtas is situated a few kms off the modern Grand Trunk Road (though right next to the original one) around 100kms from Rawlapindi/Islamabad and 200kms from Lahore. It is thus well situated for tourism from these major population centres and the nearby city of Jehlum appeared to be something of a boom town for economic development – in Pakistani terms anyway. As we approached it, the large numbers of people and vehicles going our way suggested that something “special” was occurring and even before we reached the gate we had to argue our way past the police. It turned out that an Ashura procession was going to take place in the village within the fort. Shiites mark the day with processions of mourning in which they re-enact the battle of Karbala (in Iraq) in which Hussein, considered by them to be Mohammed’s legitimate successor, was killed. This is a time of heightened religious fervour and indeed we saw pilgrims at Rohtas with bloodied shirts covering their self inflicted flagellation wounds (see http://en.wikipedia.org/wiki/Day_of_Ashura for more). It also becomes a period of heightened tension between some Shia and some Sunni – later that day, in nearby Rawalpindi, 9 people were killed and others injured in Shia/Sunni riots suggesting that the authorities’ concern wasn’t totally without justification. So, at the gate itself, the officer in charge said he couldn’t let us in to the village area as security couldn’t be guaranteed – not because we were foreigners but because we might get caught up in something unrelated to us and the authorities were not prepared to take that risk. This was probably an over-reaction but the guy had his job to do so we generally accepted the situation and concentrated on negotiating our way through the gate and onto the ramparts on either side with promises that we wouldn’t go any further into the village! Thus, we were able to climb the double entry gate and walk several hundred metres in each direction. Afterwards we parked away from the fort and walked into the fields to get external views from other sides. In this way we got a pretty good feeling for the nature of the fort’s situation from both inside and out. It continues - “There are no surviving examples of military architecture of this period on the same scale in the sub-continent which survive to the same degree of completeness and conservation. Fatehpur Sikri (India), which is already on the World Heritage List, represents the full Mughal realisation of a form and style that owes everything to its precursor, Rohtas Fort.” Now, Fatehur Sikri (1569) is described as follows in Wiki “a planned walled city ….. (containing) a series of royal palaces, harem, courts, a mosque, private quarters and other utility buildings”. Yes, it was a “fortress” in that it had a surrounding wall but was, in no real way “military architecture”. And its architectural style isn’t particularly relevant - “Akbar planned the complex on Persian principles. But the influences of his adopted land came through in the typically Indian embellishments” and “a synthesis of various regional schools of architectural craftsmanship such as Gujarat and Bengal…Influences from Hindu and Jain architecture are seen hand in hand with Islamic elements.” The 2 complexes are chalk and cheese and their linkage seems more than “strained” - it smacks of trying to “talk up” Rohtas! Rohtas, constructed in 1541-3 is an example of a “fort” built by the Muslim invaders of N India before the Mughals fully established themselves and developed their own “style” (There are others even earlier – e.g Tukhlukabad dates to 1321 and Daulatabad to 1327). It was constructed during an early downturn in the Mughal fortunes when Hamayun lost control of the empire created around 1526 by his father Babur. He had only ruled for 10 years when he was defeated by one of his subject rulers from Bihar, Sher Shah Suri, in 1540 and it took him until 1555 to regain control with Persian help. In this interim, Rohtas was built by the victor to control local tribes and defend against a possible Mughal return – although, when the time came, it surrendered without a fight. It is important when considering so-called “forts” in S Asia to differentiate the wide range of types of “military architecture” they represent in terms of geographical location, period, style and purpose – the Rajput “Hill Forts of Rajastan” inscription justified its serial approach on this basis (but, with criticism from ICOMOS, failed to use Rohtas as a comparator even though it did use E.g. Kernave in Lithuania!). Taking the “purpose” aspect, although the word “Fort” is used for all of them, one can identify at least 3 categories which could alternatively be named using more precise English words - true “Forts”, “Fortresses” and “Castles”. Thus a “Fort” is a military structure, relatively limited in area, housing a number of soldiers. A “Fortress” on the other hand is a much larger enclosed area, possibly encompassing a town, whilst a “Castle” implies a residence, albeit fortified – either strongly or later even to some extent “for show” and, in reality more of a “palace”. In these terms Rohtas is very much a “hill fortress”. It is primarily a large defensive wall (c 5kms long) using the hill geography as the basis for defending an enclosed area (c 51ha) within which a force of some 30000 men could be held. There is an inner wall in one corner to create a further “Citadel” but, the only original permanent building appears to have been the mosque built into the wall. The other 2 historic buildings which are present today both post-date the Fort – The Haveli (= Mansion) Man Singh and the Rani Mahal (= Queens Palace). The most important structures within the walls were 3 Baolis (or Tanks/wells) to supply the troops with water. Subsequently, a number of tombs of “Saints”, have also been constructed. Unfortunately we were not able to approach any of these. I mention these aspects because they are important in understanding why it is that the area within the walls contains a large and rather ugly village – there never were historic buildings there and the interior always was an open living, even farming, area. The village has been categorised as “buffer zone” making the inscribed site a sort of “donut” with a hole in the centre! So, it was a shame that we were unable fully to explore the fort and extract full value from our visit, but the experience of being shut out had its own interest, and, from what we saw in the distance during our walk along the walls, and from what I have since read, I don’t feel that we missed out too much on what the site had to offer. As to its value relative to other forts in the region – well, even if the AB evaluation (and some of the reviews on this site!) has gone a bit OTT, it is quite impressive. I personally found Kot Diji and Derawar (neither on the T List) more so but the T List site of Rani Kot less so. The former 2 were both 18th Century structures and it may be true that none of them display the military history significance of Rohtas. In any case the site should not be missed if you are in the area. I am from Rohtas itself. We are very fortunate to have such a unique historical place as part of our Muslim heritage. Its architecture, planning, and shear size is amazing. One cannot comprehend how some 600 years ago when there was not any modern machinery in use, how Sher Shah's architects used their skills to build such a large fort on the edge of sharp hills with their high, thick walls. How did they carve out the Bawli, build the Sohail Gate, Shishi Gate and others? I encourage all readers to visit the place and appreciate its grandeur. I assure you will fall in love with the place. Despite its positives, it has some negatives. Can we make a similar fort in today's age and at what cost? Obviously no. This begs the question, what has the government done to preserve this National Heritage? It's no use repairing and patching up small pieces of the Fort with the help of NGO's instead of putting its own resources in use. What about repairing it in totality and maintaining it? The government with the assistance of UNESCO, international donors, should repair it and encourage tourism to the site. it should build and provide facilities for visitors including public conveniences, a rest house, parks, cafes, a good and reasonably priced restaurant, tourist information office and reading room? My name is Yasir. I am working as trainer in Pakistan Telecom Company Limited (PTCL) in Islamabad. I have been visiting Jehlum for giving training to the PTCL workers (13 days) with my friend Farrukh Bashir.We visited Rohtas Fort today (28 march 20120. I rapidly fell in love by seeing it outside. It is an amazing place to visit; a glory of our past. The most amazing thing of the fort is its choice of place (who constructed the fort). It could be made on Tarakki Mountains for its high elevation. But considering the southern high dark stony edge (for defensive/safety) and Western River (for drinking, living water for man + animals) make sense. We were wondered how this fort would be build in this uneven and rocky surface. This place is watch worthy. I visited this fort first time, i was very much amused to see this because it is a wonderfull building. To see this bueatiful fort it can be imagine that how much efforts were made to built this huge FORT. It is really an ASSEST for the country. One thing which was found very special for me that is a DEEP WELL in the fort which can be seen at bottom by 139 steps downward n it gives an idea that how much effort were put to dig that WELL. If you visit there then please dont run on the steps while comming up. I am delighted to see so many friends from Rohtas. My story is not an exception. I also belong to Rohtas, though I have never lived in. My father was born there and completed his education from Rohtas. Since childhood my father took us to Rohtas and showed his old school, madrissah and living place. Its a very special place for me. Now I am abroad but the most I miss here is Rohtas fort's pleasant & fresh breese. One certainly feels his soul been taken to some other era of peace where the time has its own pace. I would like to focus everyones attention to the environmental issue which created due to the large number of visitors. Now you can see shopping bags, pet bottles and other wastes everywhere. The visitors and the management authorities must take responsibility to keep the nature clean. Since my childhood i had loved the Rohtas Fort and always longed to visit it.i collected many things about it and knew each and every part of the fort. when i became a school teacher i was to take the students for a trip. i decided to take them to Rohtas Fort. i felt as if i had traveled in the glorious past the moment the bus entered the beautiful fort. the stairs and rooms made me wish that had i been there and drank water from the baoli. but its deteriorating condition saddenede me. but when i heard that it is being renovated i was delighted. i wish that it is preserved properly and people start loving going there for visit. i wish i can go there again. It was in the early 1990's when I went to Rohtas Fort. I found it an enriching experience and it is this place that triggered my passion to study ancient cultures. Rohtas Fort is a huge architecture wonder with secret open windows that look out onto a water way. I was very fond of the curved windows, and the way the wild grass flows together with the brick constructions. I would indeed recommend that you see this Fort. And I am very glad that UNESCO has acknowledged the importance of this site. It has been exactly 20yrs since I last saw Rohtas Fort. I was very young at the time and was completley amazed when I saw this historic sight. It was a lovely sunny day. I was staying with my mothers sister at the time in a near by village, and my cousins took me to see the fort. They were very well informed and were able to explain the history behind the fort to me. Some of the fort did seem somewhat spooky, with out a doubt it actually takes you back in to history. I would suggest that anyone who goes to Pakistan must visit this historic sight. Choose a day when the skys are clear, take with you plenty of water and wear some sensible shoes as there is a lot of walking, and also take a bottle of sun block if needed. You will enjoy and will want to go back, just like I do. I Live in a village "Said Hussain" very close to Rohtas fort. For me this fort is the most trust worthy friend. I am visiting this fort since my childhood. If anyone wants to see the most beautiful sun set on earth, just have a visit to Rohtas fort in the evening. Sit at the top of "Shair Pinjra". In front of you will be the "Ghan" and the settling sun. I have seen the time when there were decorative strids in "Rani's Mehal". The western side was not as much destructed as it is now. In Recent years Govt.has started a programme to preserve the Rohtas fort. But its too late. This exercise should have been planned decades before. Presently aome tream of experts is trying to re-develop the destroyed parts. I Must say that their efforts are appriciable. They are trying to keep the original building structure. The western portion which is very beautiful and is getting rapidly demaged needs an immediate attention. Road and the bridge now invite lots of people to visit Rohtas fort. I suggest that funds generated from visitors fees must be honestly spent on rehabilitation of the fort. There are beautiful landscape views when you are going to Rohtas by Road. Just have a stay over the top of Village "Rehana" and the senic beauty arround will capture you. If some one like to have an adventureous vist then prefer to go by the Offroad track.You will be travelling through the "Nala Teen Pura" also known as "Kass". This track is suitable for Jeeps or Good Motor Bikes. Donot take risk to get on this track with small cars. One thing which is always painful for me is that people visiting the fort recklessly spread arround the empty containers and packages. Specially the "Ba.wali" is almost filled up with this mess. If anyone can dare to stay a little more late after eve,in the Rohtas fort in a full moon night,I gurrantee,he or she will be feeling like in love with the Rohtas fort. (Like i am).Its a safe place to stay a little late even.Now you will find Gaurds there as well.Besides the people at Rohtas are also very peaceful. If you want to really enjoy your visit to the fort, plan a full day tour. This is a fort with hidden beauties. I have found a new look in it every time I visited. Donot forget to to see the western portion. Besides the "Shahi Mosque" stairs lead to downwards. There you will find an excellent piece of romantic architectural art. You will find the Well (Dry Now) with windows opening inside the walls of Well. Most of it is though filled up with sand and soil but still, still its amazing. Offer the prayer in Shahi Mosque and feel the dignity and peace in your heart for getting part of a history which is hundreds of years old. Avoid to have visit in hot summer months specially May, June and July. Its built on a hilly area and and people get exhausted soon in summers. Keep in mind to wear some hiking shoes and easy dress because in Rohtas its plane stupidity to have a visit with drees/office shoes. When you are in the fort, Let you mond free to feel its beauty. Best wishes for your visit. i visited the great Rohtas Fort in july 2004 and found it to be an awesome awe-inspiring place. The breathtaking views of red sunset over the kahan is a view one can charish for life. The fort is a prelude to the builders and architects of the time it was built. An individual can read and hear as much he/she about the great Rohtas fort. However it is only when one actually visits the fort that the magnitude and splandor of the place is felt, and it is such a great feeling. A must for all Jhelumee families on a visit to Pakistan to take their children to the Great Rotas Fort and introduce them to the rich and sometime forgotten and under valued Pakistan heritage. I am from Village Khukha, which is a couple of miles north Of Rohtas. On a clear day I can see the ramparts from my house and the site is stupendous. I highly recommend you to come and see it for your self. In my view no other fort in the world comes near to the shear size and scale of this place. The Govt. of Pakistan, with international assistance, should make greater efforts to preserve the site and encourage visitors, especially from abroad. I am a student of Muhammad Ali Jinnah University.I visited Rohtas as a part of my project with my class(MBA).Its a place worth visiting, the style of architecture, planning, giant walls, well, tombs,etc., are very interesting. We can't imagine that such a big construction can be done manually and in such a short time (8 years). We also saw work under process and there we got some idea, it was amazing, the skills of the locals are beyond imagination. We spent a whole day visiting the fort still we could not see only 60% of it, still we enjoyed alot. It was a memorable day. What we heard about Sher Shah Suri, was proved. We have been useing the GT Road(Grand Trunk Road) also built by him but we saw his taste of construction, it was great. I recomend that if you visit Pakistan try to visit Rohtas and Lahore fort I can asure you will enjoy a lot. I took a a one day tour from Islamabad for the Mangla area. The first stop was the Rohtas Fort. The road to Rohtas is excellent, and the a new bridge had been built. The site is awesome. Every quater there is a sound and light show, that gives the history of Sher Shah Suri. A must see when taking the Manla tour. The Mangla Fort is another good sight. Captured from the Indians at partition, one is amazed how this could be done considering the fortication. The view and the scene of the the sorrounding area is breathtaking. Water sport is provided. This consists of: use of the facilities,a boat ride, fishing ( licence and tackle provided), use of the one man and two man kayaks,and sailing. All this for a cost of Rs 500 approax. -- 10 US dollars. On payment para sailing,water skiing and speed boat rides are available for a minor cost. Bureau - pending better protection and comparative examination of properties of this type in the geo-cultural area concerned. Baths: The Shahi Baoli has small chambers that were used as baths by the Royal family. Glazed tiles: The tiles on Shishi gate are the earliest example of the usage of glazed tiles that became popular with the Mughals. Stepwells: Has 3 step wells - "Bari (Main) Bowali: It is in the middle of the Fort for soldiers, elephants, horses etc. This Baoli has 148 steps (now 134 left due to filling of mud). Each step is 20 cm (8 inches) wide. The upper portion has been cut in stone. It has three arches that span the length of the baoli." Places of Execution: "Immediately to west of the Haveli stands the execution Burj(tower), primarily dealing with rebellious princea nd other royal traitors. The execution tower has a raised platform with a hole at its center through which the unfortunate victims were thrown. The execution used to be done in the presence of the ruler living in the White Palace." Sikhism: The Sikh "Temple of Baba Nanak" is inside the inscribed area albeit just outside the Fort (see the AB Evaluation map top left). Sikh belief is that Guru Nanak Dev Ji (1469-1539), the founder of Sikhism, visited the location of Rohtas Fort before it was built in 1541 during the third of his major journeys to spread the teachings of what was then the beginning of Sikhism. The Guru is believed to have spent 40 days atop nearby Tilla Jogian Hill before passing by Rohtas 24kms away. The Temple was built around 1834 when the area was part of Ranjits Singh's Sikh Empire. 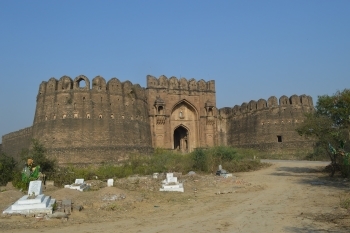 Built in the 16th century: "Qila Rohtas (Rohtas Fort) was built in 1541-43 .... after the Mughal Emperor Humayun was expelled after his defeat at Chausa by Sher Khan"
Need for a Comparative Study: Military Architecture of region - two comparative studies have been carried out: Military architecture in the geo-cultural region Central and South Asia: a comparative study by Niels Gutschow, lhsan Nadiem. Abdul Rehman, and Zeki Siinmez (January 1997) and Fort de Rohtas, Pakistan: Etude comparative by Pierre Bnm (April 1997).